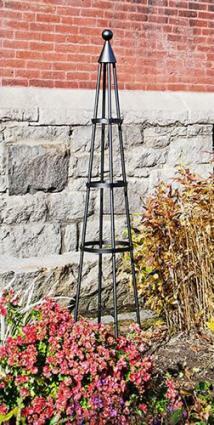 Wrought iron garden obelisks can serve many functions. In a flower garden, they provide support for flowers such as climbing roses, clematis, morning glories and many other plants. In the edible garden, many types of vining fruits and vegetables can be grown on wrought iron obelisks such as various types of beans. Obelisks provide four season interest and focal points in the garden. They can make your garden look as if it was designed by a professional. Like wrought iron garden gates, wrought iron garden obelisks are made from forged iron or a metal composed primarily of iron with something else mixed in such as steel. Garden obelisks come in a variety of sizes and shapes. Typical shapes include tall, rounded or oblong forms, rectangular forms, and pyramids. Plants take to any shape. Choose the shape that is pleasing to you and blends in with your garden. Obelisks are typically found in more formal garden layouts. They create a focal point in the garden year-round. A focal point is something in the garden that draws attention to itself. Statues, obelisks, fountains and special trees and shrubs are often used as focal points. Since your obelisk will be very noticeable, you'll want to take your time choosing just the right one. Most local home and garden center shops and big box stores offer garden obelisks in various sizes. Wrought iron ones may be found at many shops or specialty stores. Salvage or antique stores may also carry wrought iron garden obelisks. These have the added benefit of recycling something that otherwise would be scrapped and adding a bit of history to the garden. Wayfair offers a sturdy five foot tall wrought iron obelisk for just over $50. Customers rave about its elegant design and sturdy construction. It ships for free. For $90 Plow and Hearth has an eight foot powder coated steel model that will stay rust-free for many years. The unusual feature on this obelisk is the round horizontal bands that hold it together double as pot holders, to create a multi-layered, multi-functional garden centerpiece. Sears has a very economical obelisk that is tripod-shaped with a fleur-de-lis at the top, priced at less than $20. It is uncoated, so it will rust naturally over time. 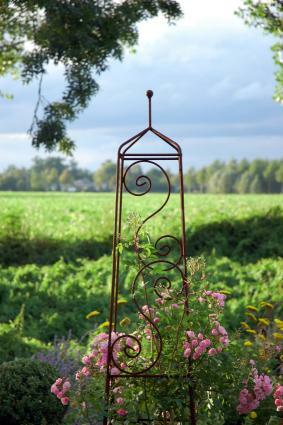 A Rustic Garden offers a vast selection of metal obelisks, including many that come in a quaint pre-rusted form. Check out their petit ball top flower support obelisks, which cost around $40 for the 26 inch model, $50 for the 33 inch one, and $70 for the 45 inch one. For a non-traditional look, try the futuristic, mushroom-shaped obelisk from Rakuten. It's six feet tall, powder-coated with a bronze finish and is free to ship. Many, many other online sources offer obelisks. With so many to choose from and price points ranging from under $20 to hundreds of dollars, it pays to shop online first to get an idea of what you want. You may want to print out pictures of various obelisks that appeal to you and bring them to your local store to see if you can find them locally and save on the shipping costs. Garden obelisks can be used in many ways. Traditional use includes supporting flowering plants. Climbing roses such as Blaze, Joseph's Coat and other varieties need a sturdy support such as a wrought iron obelisk or a garden trellis. Trim the canes and tie using garden twine until the plant has matured. The obelisk will blaze with rosy color throughout the summer. Clematis also needs a support of some kind, and an obelisk creates a massive tower of purple, white or reddish pink blossoms, depending on the variety of clematis. If you'd prefer an annual flower, try growing morning glories on an obelisk. 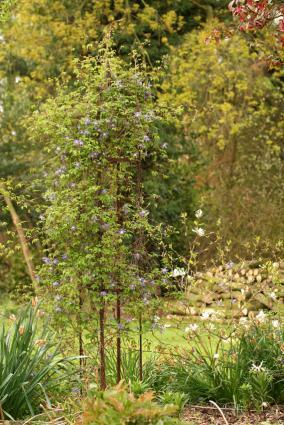 Use an obelisk for vines such as ivy and create living green topiaries. Bring an obelisk indoors and embellish it with tiny white lights at Christmas time for a holiday decoration. Make sure you place the obelisk on a flat piece of ground. Use a level tool when placing the obelisk and backfill with soil if it's not even. Otherwise the obelisk will list to one side over time. Be sure to bury the feet of the obelisk in the soil. The soil will keep the obelisk from tipping in a strong wind. Overestimate the size. Buy an obelisk that's slightly bigger than you think you need. This will enable your plants to grow to their fullest potential. If the obelisk is too small, you may end up trimming back the plant more than you'd like. Try an obelisk for an indoor plant such as jasmine or other climbers. Small ones can be placed inside a pot. If you choose not to grow plants around the obelisk, hang suet or bird feeders off the obelisk to attract birds in winter. Whether you're looking for an obelisk to accent a garden path, add color and beauty to a vegetable garden, or create an instant focal point, obelisks are a classic way to add interest to the garden. They make a statement with or without plants growing over them - just be sure to place them where you can enjoy their presence on a daily basis.